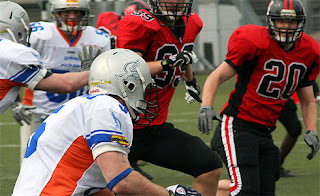 The Budapest Wolves host the Ljubljana Silverhawks this weekend in what is their official last chance to turn the corner on a, until now, disappointing season. Even though their chances are small as it is, a loss would mean official elimination, as it would drop them to 0-4. A loss would also mean they would finish the season below .500 for two consecutive seasons. Last year was not their first such year, but two in a row would be a first. Since they already lost twice to the Wild Boars, they cannot finish the season ahead of them. Additionally a three way tie is not possible since they play their next opponent twice and either the Vukovi or the Wild Boars will reach at least four wins, because they still meet in Kragujevac. So the chances, although quite small, still exist, but they involve hoping that the Vukovi, the most convincing team thus far, to lose all three of their remaining games. Their opponent hasn't been much better, but at 0-2, their chances are a bit more realistic. Of course, they need to start winning and this game is probably their last chance as well. Ironically, a Wolves win would keep their season alive, but would put the Silverhawks in a similar situation the Wolves are in now. The Silverhawks' championship defense has been poor until now, but they showed a bit more competitiveness than the Wolves. Their biggest problem has been that they were unable to sustain their good play, with long stretches in both games where they failed to score any points. If that's enough to make them favorites is difficult to say. The Wolves still have some pride left and don't want to get shut out with no wins at home this season. The game will be played on Saturday, 3PM CET.